Although almost any photograph or graphic can be used as the Main Image on a SavvyCard, the best solution is often to use a "cut-out" image, where the person or object is clipped out from the background. This is achieved by taking a normal photograph and using a photo editing program to convert the original image (which will probably be a .jpg file) into a transparent .png file while removing the subject of the photo from it's background (see example to the right). 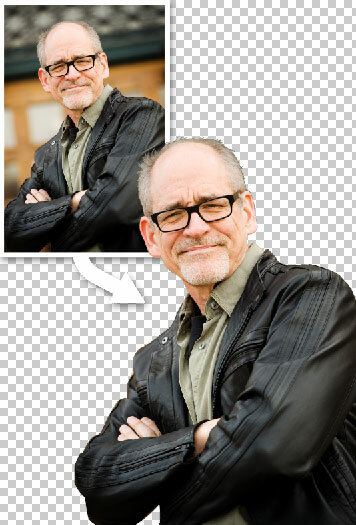 Getting a perfect looking cut-out picture can be time consuming and difficult for users who are new to the process, but luckily there are easier options. If your company has access to a professional web or graphic designer, they will be able to create a transparent .png using Photoshop or similar design tools and they will also be able to touch up reflections in glasses, "red-eye" and other issues with the orginal image. If you don't have a designer handy, you can opt to work with SavvyPhone's designers instead by ordering design services from our Services page.